The poplar trees in North America are all members of the willow family. They include cottonwoods, aspens and balsam poplar. These trees occur across much of the continent, with some having a transcontinental range. Each of these species has distinct features, with the differences in them the key to you being able to identify them. The largest of the poplar trees in terms of height is the black cottonwood, as it can attain heights of up to 125 feet. The plains cottonwood and the eastern cottonwood grow from 75 to 100 feet tall, with their trunks so wide in some instances that the "National Audubon Society Field Guide to Trees” describes them as “massive.” Varieties of medium-size poplars include the Palmer cottonwood and narrowleaf cottonwood, which grow from 40 to 80 feet. 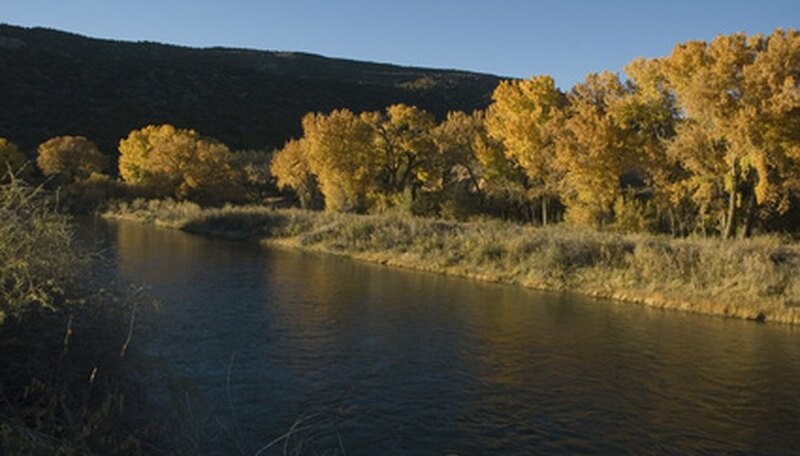 Small poplars include aspens, as the quaking and bigtooth varieties are in the 20- to 60-foot category. All poplars are deciduous trees, shedding their foliage before winter across their ranges. The leaves have different shapes and sizes, with some like eastern cottonwood being heart-shaped and others like black cottonwood having a wide base but tapering to a sharp point. Narrowleaf cottonwood has an atypical shape for these species, with the foliage resembling the narrow leaves of weeping willows. The widest poplar leaves belong to the swamp cottonwood, which can be up to six inches across. The poplars have male and female flowers on separate trees. The female trees give many of the poplar species their cottonwood name by producing seed capsules that open up when ripe, releasing myriad small seeds that have a cottony appendage attached to them that make them airborne. The landscape can have these floating seeds all about when the cottonwoods ripen. To recognize trees as poplars before the leaves emerge in the spring, you can study the buds on the twigs. The buds are pointed and long, growing out at an angle from the branches. Covering the buds is a number of scales that overlap on one another. Poplar bark is usually dark such as gray, brown or almost black on the mature specimens, with the bark often having ridges and furrows in it. Poplars are a common sight growing next to waterways, as they prefer damp soil. The shape of poplar leaves, combined with their typical long stems, makes them prone to shaking when the breeze stirs. This is a good way to identify a tree as a poplar, especially when winds are light. The poplar leaves shake and rustle, creating a noticeable sound as the wind moves them about. The quaking aspen takes its name from this trait, but all poplars will see their leaves shake to some degree in light wind conditions.